Finally we took the decision to send Perk to a playschool.It was a difficult decision as she is just 2 years and one month old.But a bundle of energy that she is , the confines of the home no longer held her interest.She was growing restless and demanding.The smallest of chores around the house were not getting my attention. She wanted me by her all the time.The cupboards were staring at me ,the kitchen was screaming for attention and the cockroaches in the bathroom were having a ball.I thought six months more and then she would be fit to let out into the world.But that would mean the household having to wait for another six months..And then there was Munch who was also a kid who had her own set of expectations from her mom.And usually after she came back from school ,Perky was even more particular that I only listened to her.She screamed,she cried,she got her way…. The hubby who is a much,much stronger person than I am.. took the decision.It was time …he said.But my heart said ..she is too young.But it will only be for a few hours…he argued and you can get a lot done around the house in that time. I felt guilty…was I so inefficient..that I have to send my darling out to a daycare?But what with cooking,dusting,maintaining the garden,hosting people from time to time and J’s studies.It took up my entire day.With a heavy heart went around to look for a good playschool for her close by. And the very first one we went to..made our decision easy. It had a sprawling campus for a playschool.A large play area with a doll house,lots of swings,rabbits,aquarium,classrooms with pretty pictures on the walls,a screen in each classroom playing rhymes and cartoons and above all a warm and friendly staff.I took a liking to this place instantly. We went around a few other schools but after the first one I was not going to like anything else.The standard was set. I would not settle for anything less than the best .And the smile on Perk’s face whilst she held my hand and went around the school told me that she liked it.And on being asked whether she wanted to come back here ,she gave me a confident nod. So the next day,we dressed her up ,fed her and told her she was going to go to school like didi.And that mumma was going to be at home and wait for her to come back.I don’t think she heard any of it.She was super-excited about her brand new school bag and bottle and insisted on carrying it all herself.We dropped her to school and lurked around .My heart beat fast.Was she okay?Was she crying?Had she noticed that I had slipped out of her classroom?I went in every few minutes and enquired and the answer was that she was quietly sitting in a corner and observing everyone .Not Crying…The hubby told me it was time we left her..Something inside said ,just a little while more.. I did come back albeit to a home which didn’t look like home at all.For the past two years, this house had become used to a child being present 24 hours a day..their shrieks,their giggles,their fights..the house seemed ominously silent today. We both had a cup of tea in the garden and shared some quiet moments in a long ,long time. 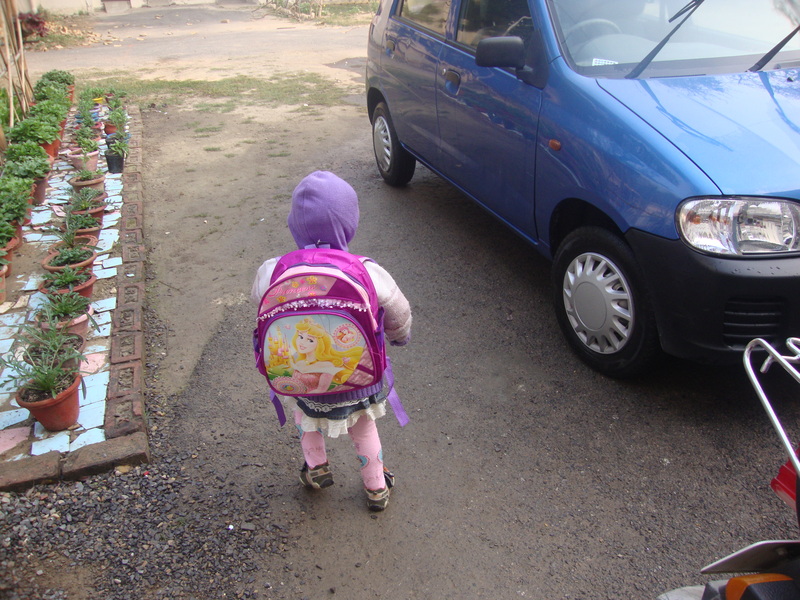 That was Perk’s first day at school. How was your experience of sending your child to school?How tough was the decision?How quickly did your child adapt?Do share.